When you heard the news that General Michael Flynn had flipped, I just wanted to assure you that those of us of Filipino heritage aren’t upset by the use of that phraseology at all. We’re ecstatic. At least, I am. Flynn, the former National Security Advisor to Trump, is no flip, but he most assuredly has flipped. He’s the first member of the Trump inner circle to admit to lying to the FBI–a felony that could get him five years in prison. Flynn’s flip begins paving a path to the truth, that one commodity that has been in short supply in the Trump administration, where lying seems to be a way of life. As a witness for Special Prosecutor Robert Mueller’s Russia probe, Flynn could be the key to putting the screws on others on the Trump team, including the orange man himself. Trump’s response? After an inordinate period of quiet, the tweets go on. The twit was back to twitter like it was his confessional, providing his very own flip. Of course in February, when asked why he fired Flynn, Trump was pretty blunt. “I fired him because of what he said to Mike Pence, it’s very simple,” Trump explained to reporters. He must not think there’s any video tape in the cameras or that we are as daft as he is. Trump has repeatedly pointed to Flynn lying to Vice President Mike Pence. He never mentioned the FBI lie. Did he know about it and didn’t say? Were Trump’s repeated attempts to get leniency or immunity for Flynn an obstruction of justice? That was clear to California Congressman Ted Lieu, an outspoken Asian American leader, who took to Twitter himself. It’s important to note, you don’t see many people of color speaking out on the matter. But it’s been Lieu’s style since his days in the California state legislature to be outspoken and take on the tough issues. The weekend Twitter storm on Trump’s flip only got worse after Trump’s lawyer John Dowd said he actually wrote the tweet, not Trump. And then Dowd told the Washington Post that Trump had known about the Flynn lie for months. The president is above the law? We’ve heard that one before. No one is above the law. Not in a democracy. If the truth is important, it’s time for Trump’s base to flip on Trump. The man does not deserve a base. Of course, he tweeted out to his base again Monday, about how he supported the Senate candidate accused of sexual harassment, Judge Roy Moore. Trump and Moore have some things in common. Tweeting about Moore wasn’t just Trump’s attempt to flip the page from the Flynn flip. But the two are somewhat related. Last Friday proved how important every vote in the Senate can be and why Friday was not a good day for the Republicans. Congressional leaders probably thought that going past midnight into Saturday would give them a new calendar day and help them forget the stench of Flynn’s guilty plea, make us forget it ever happened. Nope, it’s still smells bad. The Trump/GOP’s only legislative win for the year still should make all Americans feel unclean after the Republicans passed its tax proposal, what I like to call the One Percent Enrichment Plan. That’s who benefits in this reform of the tax code. The wealthy, the corporate. They’ll get the biggest permanent breaks. And normal people? The middle class? In the long run, they get shafted. In order to have affordability in insurance, you need large numbers. Everyone in the pool, right? To get everyone buying in, it needs to be mandatory. Everyone gets covered, and costs go down. Get rid of that, and affordability is a joke. As we go into the reconciliation period, 13 million people stand to lose their health care. Thank you, Republicans. One Republican who was with the Democrats to oppose the tax plan was the retiring Arizona Sen. Jeff Flake, who has been a Trump target in the last ten months. Trump’s lashing of Flake has been so severe, it made me wonder why Flake would give the plan its 50th vote, assuring (with a Mike Pence tie-break vote) Trump’s first legislative victory. But apparently, Flake had something in mind. Enough to ignore his Trump spats, or the $1 trillion the tax plan would add to the national debt, or the millions of people losing health care. Flake must want to run for Arizona governor one day. He wanted assurances on the Deferred Action for Childhood Arrivals program, DACA. Maybe it means something both Democrats and Republicans can vote for—unlike a tax plan that was all partisan at 51-49. And now that we see once again how the sausage is made, do we really want to eat any of it, let alone participate in its making? If you have an issue worth fighting for, of course you do. 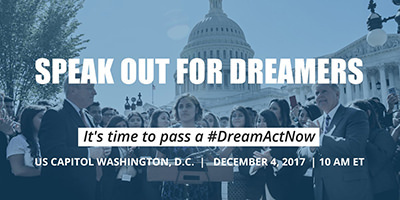 But it means heading to the swamp, and that’s where AAPI Deferred Action for Childhood Arrivals (DACA) recipients are joining up with others, including Haitian immigrants fighting for extension of Temporary Protected Status–an unprecedented show of unity for immigrant rights this week. They realize they’re all in the same boat. And now it’s time to speak out. Hwang, 27, a graduate student from New Jersey, will go from one congressional office to another with his new dream. “We are trying to push for a Dream Act that’s clean, without the enforcement pieces,” Hwang said. That would be a Dream Act not conditioned by a wall or linked to ICE funding or “balanced” by the deportations of those who didn’t meet DACA requirements like their parents. Wonder what Sen. Flake will tell them. Trump, who has flipped all over the place on DACA, probably sees the retiring Flake as irrelevant. Especially if Trump gets Roy Moore, whom he sees as a bought-and-paid-for Republican vote, into the Senate next Tuesday, Dec. 12. And then DACA, Flynn, his flip, the Trump flips, obstruction, none of it matters. If Trump has the votes in Congress, the tweeting president may be able to stay above it all. Let’s hope his base flips. Or democracy loses.